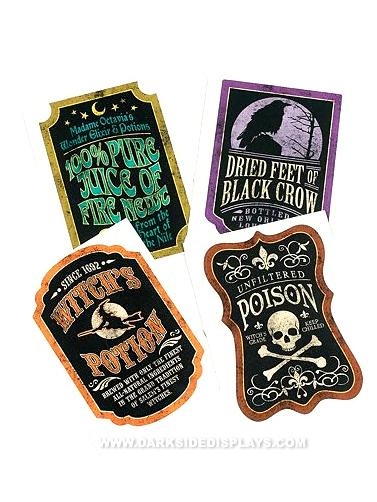 Apply these creepy drink bottle labels to ordinary beverage bottles this Halloween for a frightfully fun look. Set of twelve includes 4 designs, "100% Pure Juice of Fire Newt", "Dried Feet of Black Crow", "Witch's Potion" and "Unfiltered Poison". Stickers are repositionable. Creepy Drink Bottle Labels measures 4"H. 12 pc.